Are you one of the more than 12 million American that suffers from sleep apnea? If you know the answer is yes, you’re already more informed than most sufferers–too many people never realize that their sleep is interrupted by this disorder. Often, adults assume poor sleep is a consequence of aging and simply live with the side effects, like fatigue and difficulty concentrating at work. The annual presentation for all of the company big wigs went really well. You felt confident, and sure that you emphasized all the right points and that your department would be proud. Except for one thing. The entire time you presented you felt like no one could take their eyes off your teeth. You’ve had crooked teeth your whole life and never wanted to deal with the hassle of aligners, but you’re starting to wish you would have taken them to fix your smile as a teenager because the higher you rise in your company, the more people seem to notice your teeth. When you think about the alternative, a mouth full of metal, you start to feel like you’ll never be able to have a smile you’re proud to share. Dr. Brad Weiss has helped many people just like you straighten their teeth invisibly; restoring confidence and a happy, healthy bite. Invisalign clear aligners straighten your teeth with less time spent in the dentist’s office, no mouth full of metal, and a straight smile you can be proud of. Call to schedule your Invisalign consultation today. At the dental practice of Dr. Weiss, we’re dedicated to helping every patient achieve the best smile. When crooked teeth start to interfere with your ability to confidently perform at your job, smile for your family photos, or even makes chewing or speaking more difficult, Invisalign from Dr. Weiss can help. Unlike traditional aligners, Invisalign clear aligners are virtually undetectable. You can interact with coworkers, friends, and family as usual, and only those you want to share with will know about your tooth straightening treatments. Better yet, when you have a big presentation or photo opportunity, you can remove Invisalign, and replace after your big moment. Invisalign’s alignment trays are uniquely designed to apply gentle pressure on teeth to shift them into alignment. Traditional aligners use pressure from surrounding teeth to pull your bite into alignment causing more discomfort than most patients report when using Invisalign to straighten their bite. 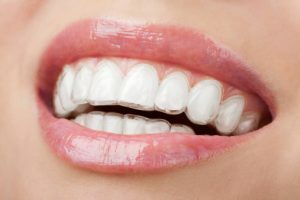 Additionally, because the alignment trays are removable, you can maintain your typical dental health care routine. No need to floss and brush around aligners attached to your teeth. Are you addicted to popcorn or taffy? With traditional aligners, kiss those delicious treats goodbye, but with Invisalign you can remove your alignment trays and eat anything you want. If all that weren’t reason enough to find out more about Invisalign, you can also count on needing less than half the number of dental office visits to adjust and maintain your aligners compared to traditional aligners. While skipping school to visit the orthodontist might have sounded appealing, missing work probably doesn’t seem like nearly as much fun. Wasting all your vacation days on painful dentists’ visits, staying late to play catchup. Save yourself the time and stress. Consider Invisalign. Imagine one year from today, you could give your annual presentation with a picture-perfect smile. All the company big wigs might be focusing on your teeth, but only because they look fantastic. You can speak and smile confidently knowing you’ve made a lasting impression. In about 12 months, Invisalign can transform your smile. Consider Invisalign to align your teeth, improve your confidence, and make your teeth feel as good as they look. Call Dr. Weiss and his skilled dental care team to find out more about how Invisalign can help you get the smile of your dreams. Our conveniently located Evanston, IL office accepts patients from surrounding areas including Wilmette, Skokie, Lincolnwood, and Chicago.